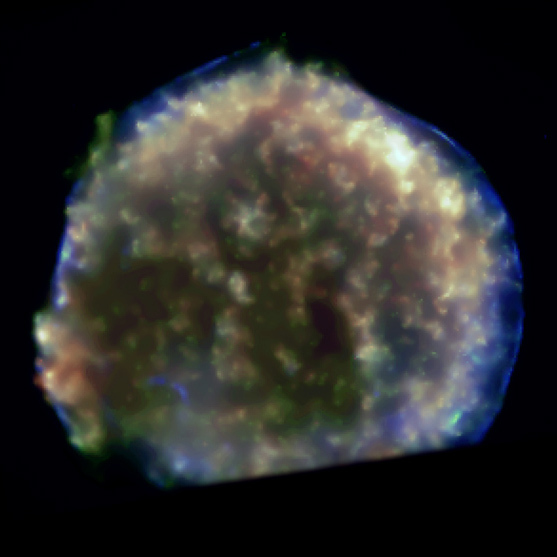 This Chandra image reveals fascinating details of the turbulent debris created by a supernova explosion that was observed by the Danish astronomer Tycho Brahe in the year 1572. The colors show different X-ray energies, with red, green, and blue representing low, medium and high energies, respectively. The image is cut off at the bottom because the southernmost region of the remnant fell outside the field of view of the detector. A shock wave produced by the expanding debris is outlined by the strikingly sharp blue circular arcs of twenty million degree Celsius gas seen on the outer rim. The stellar debris, which has a temperature of about ten million degrees and is visible only in X-rays, shows up as mottled yellow, green and red fingers of gas. Tycho's supernova remnant presents several interesting contrasts with the Cassiopeia A (Cas A) supernova remnant. The debris for Tycho is distributed in clumps rather than knots as in Cas A, and its outer shock wave can be seen in smooth and continuous arcs rather than being fragmented, as in Cas A. Also, no central point source is detected in Tycho, in contrast to Cas A. The absence of a central point source is consistent with other evidence that Tycho is a Type Ia supernova, which is thought to signal the detonation and destruction of a white dwarf star. Theory predicts that a white dwarf star will explode when infalling matter from a companion star increases the mass of the white dwarf beyond a critical mass limit, known as the Chandrasekhar limit.